Imagine if Alexander Hamilton came back to life and was seen walking the streets of lower Manhattan. Would he recognize anything of the New York he knew and loved? The answer is yes. 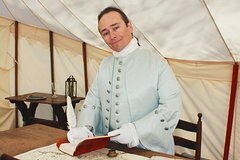 Join Alexander Hamilton as he makes history come alive sharing anecdotes from his days at Kings College to helping the Constitution become ratified all while pointing out what is still familiar to him in NYC. The walking tour lasts for about 2.5 hours and makes frequent stops pointing out over 20 points of interest that exist from Colonial New York. We start at City Hall and end at Trinity Church. Your Guide is a professional Actor, Historian, licensed NYC Tour Guide and former Chairman the International Association of Tour Managers (IATM). A wireless audio receiver and headphones are made available so you do not miss any of the wit and wisdom of Alexander Hamilton. Hamilton is alive and well in New York. Our tour incorporates all the locations from the musical in lower Manhattan as well as additional historical sites to present a complete image of Hamilton and his influence in the Founding of America. Your guide will take you to where Alexander Hamilton drilled with NY militia "The Hearts of Oak", where the Son’s of Liberty erected Liberty Poles, where Patriots fought the British prior to the Boston Massacre, and to America’s First War Memorial. The destruction left behind by our patriot brothers after the Reading of the Declaration of Independence is still visible. • Learning about all the important places where Alexander Hamilton spent time in the area. • Learning about the cultural significance of 18th century life as we see the actual remains of a Colonial Prison, Water Well and Tavern from the 1600s. This is a rare opportunity to learn about the creation of the United States from a man that was instrumental in its creation. Appreciate how an illegitimate boy of Scottish descent became the embodiment of the American dream as he demonstrated foresight, wit, courage, and intellect throughout his life. You will have an opportunity to ask questions to Alexander Hamilton throughout and at the end of the tour. The best teacher of history is one who has lived it. Your guide is a native New Yorker and a professional Colonial reenactor featured in numerous movies and educational publications. To ensure the highest quality of touring experience, a professional quality personal wireless audio receiver and headphones are used so you can always hear every word of the tour. The souvenir headphones are yours to keep. You may use your own headphones in our wireless receiver. It is ensured that you hear every word of the wit and wisdom of Alexander Hamilton on the best Historical Tour of New York City.